Sage is one of the oldest recorded medicinal and culinary herbs. Regarded by ancient Egyptians as a fertility drug, it was later applied to bleeding wounds and to clean ulcers and sores, and was taken in juice form to ease hoarseness and cough. It was also used by herbalists to treat rheumatism, excessive menstrual bleeding and to dry up a mother’s milk when nursing was stopped. The German Commission E has approved the herb’s internal use for mild gastrointestinal upset and excessive sweating, and to apply externally to inflamed mucous membranes of the mouth and throat. Sage helps to strengthen a generally debilitated nervous system. Sage is also used to infuse ear candles to treat ear discomfort caused by wax build-up, tinnitus, noise in the ears and vertigo, and for relaxation. The leaves contain phenolic acids, which act as antioxidants. Research has suggested that most of the herb’s therapeutic properties, especially its antiseptic, astringent and relaxing actions, are largely due to its volatile oil content. Ear candles have a purely physical function. Ear candling is a safe, gentle way to clear excess wax from the ears. A light suction action, or ‘chimney effect’, and the movement of the flame create a vibration of air in the ear candle, creating a feeling of warmth and relaxation. Vertigo caused by blocked ears. Do not use ear candles if you have recently had ear or nose surgery, have grommets, suffer bleeding or discharge from the ears or have impacted wax. Increase levels of glutathione, an amino acid-like compound that helps protect the liver against environmental toxins, including drugs and alcohol. Sage is a popular poultry and meat seasoning. The leaves can be used both fresh and dried. This evergreen perennial shrub with greyish-green leaves bears purplish flowers on spikes in summer. 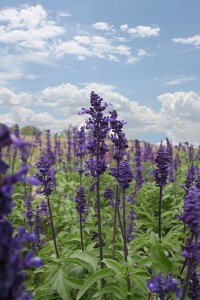 Plant small sage plants in a warm, sunny location in containers or the garden in well-drained soil. Allow the plant to grow unharvested for the first year; the leaves can be harvested at any time thereafter, although they are considered best before or just after blooming. Prune after flowering to keep plants attractive and prevent them from getting too woody.